It was quite a few years ago I was introduced to the world of Einaudi, via my girlfriend. Almost instantly I was impressed by his style and delivery. But I have to admit that I haven't kept up with his releases. Day One is pretty near perfect. 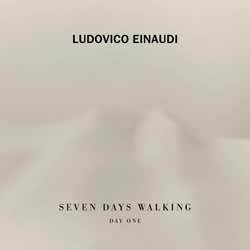 The LP holds 11 tracks (51 min, 55 sec) and rather than a quickly thrown together album, Einaudi delivers an impressive and diverse collection of themes. I was incredibly struck by 'Cold Wind Var. 1' which reminded me, in atmosphere, of Howard Shore's score for Big (1988). While I do have my favourites ('Matches', 'Cold Wind Var 1', 'Golden Butterflies' and 'Ascent') in all honesty, this is a release that works best when played from start to finish in the way the composer has ordered it. It's a richly rewarding album and I can't wait to hear what Day Two brings.